Where do you find potential entrepreneurs? 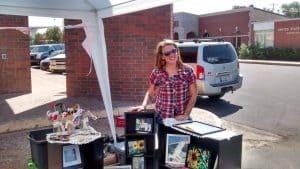 Waynoka, Oklahoma, Chamber of Commerce Pop-Up event helped entrepreneurs experiment on a small scale. Photo by Jeanne Cole. You and I talk a lot about encouraging more entrepreneurs in your community. Maybe you’re wondering about where to find those potential entrepreneurs. A couple of people have asked that question lately, so let’s look into it. The more you cut down barriers to entry, the more people will be able to try different entrepreneurial experiments. The more of these tests that happen, the more likely you are to discover the people best suited to being successful, community-changing entrepreneurs. When you let them take small steps using the Innovative Rural Business Models, you help them expand their knowledge, build up their assets and develop a following in the market. That’s why you want to find potential entrepreneurs, but not where to find them. Let’s list off some places to look for potential new business people. Look at the booths at events. Who seems to be new, or trying a new idea? Look in the beauty salons. Lots of budding entrepreneurs display merchandise on the counter. Look in other stores in town for locally-made items. Who has a few items for sale, maybe handmade? They’re getting started small. Look in the hands-on classes in high school and technical schools. Do they weld porch swings in welding class? Are ag students selling baby chicks or bedding plants? More entrepreneurs there. Look in youth education groups with entrepreneurship components. Jim Metcalf told me about their local TREP$ group. Ask the librarians. Ask faith leaders. Ask the Chamber. Ask stylists and barbers. Rural people tell their entrepreneurial dreams to all sorts of people. And a word of advice for that project to support potential entrepreneurs. Rather than try to pick winners even before people ever go into business, focus on getting as many people as possible into business in the smallest ways possible. That’s the best way to find entrepreneurial individuals. PS – Stop telling people going into business is hard. I hear that way too often. Tell them it’s easy as long as they will start small. Give them Tiny spaces and Temporary places to experiment with. Next week, I’ll share where to find local entrepreneurs online.